The first 13 PhD students of the Graduate School Helmholtz Einstein Berlin Research School in Data Science (HEIBRiDS) have started their research work. 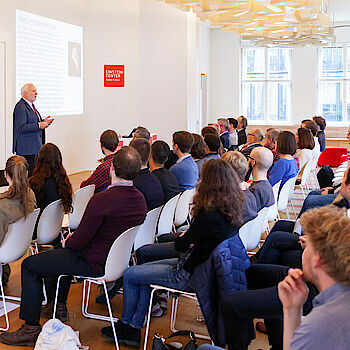 The young scientists were officially welcomed during a ceremony on 8 November 2018 at the Einstein Center Digital Future (ECDF). In his keynote speech, Prof. Dr. Dr. h.c. mult. Martin Grötschel, President of the Berlin-Brandenburg Academy of Sciences and Humanites, pointed out the challenges in the field of data science, which are by no means new, but have been appearing in a changing form for centuries and have captivated scientists. The HEIBRiDS doctoral students also have a long tradition in the Berlin area, especially when they deal with sensors for satellites, gene analysis from ice age data and the possibility of predicting earthquake strength. The 13 young scientists presented their research topics in short talks.